Rack system. L size (WxHxD): 630x330x500mm, Usable area: 550x250x500mm. Weight: 25kg. Finish: Platform - Nextel Colours, Side part - Matt Colour. You probably know too well the old discussion that a sensible rack is necessary to sound any good but it has to look nicely at the same time. We want to bring PEACE here too! Because of this we combine timeless design and very modern technology. At the same time, the design should allow for a completely free choice of surfaces so that it could be matched perfectly to the rest of the existing furniture in order to address viewpoint B above. This concept also allows for modern furniture design (e.g. low boards with 3 shelves on 2 levels) to be utilised. The sides of the rack module look very simple from the outside. Inside, however, there are lots of know-how and detail built in. The sides consist of a sandwich-construction that is unique because of the type of material used, the workmanship of the individual layers and the type of connection used. These efforts mean it is possible to absorb vibrations which could damage the machine. 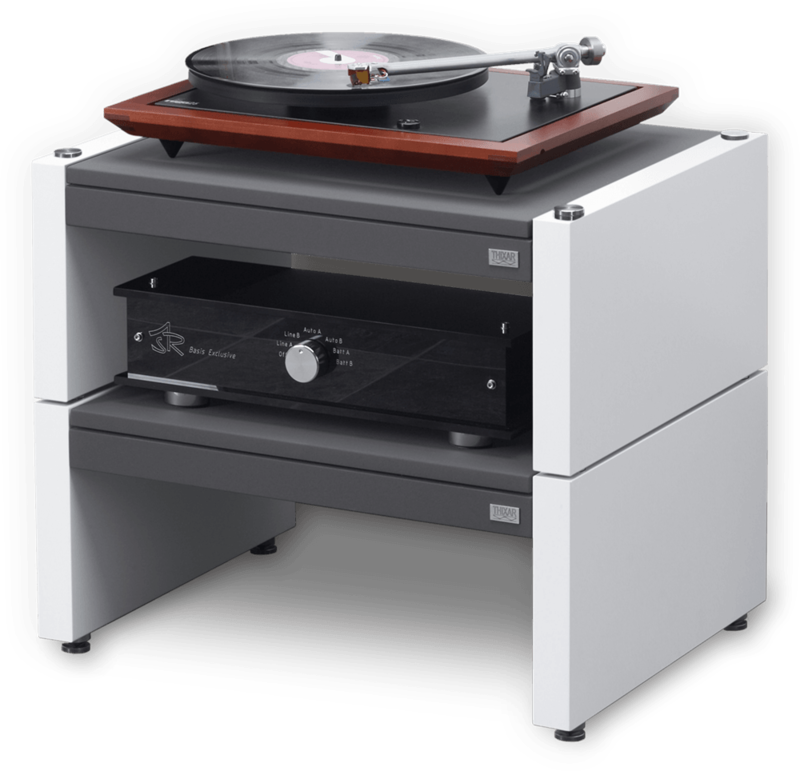 The support surface is formed by the latest version of our hi-fi-equipment stand, Silence Plus, since this provides outstanding degrees of decoupling and uniform absorption of vibration. This is essential to achieve the optimum foundation for high-quality audio components. The top surface rests on a gel layer, which effectively cuts out low-frequency vibrations. In addition, various material layers are individually prepared and then combined together to absorb the vibrations of the equipment itself. One small, unseen detail should be mentioned at this point, since it has an enormous influence on the resulting sound. That is the link between the sides and the base. There are certainly simpler and cheaper ways to achieve this. 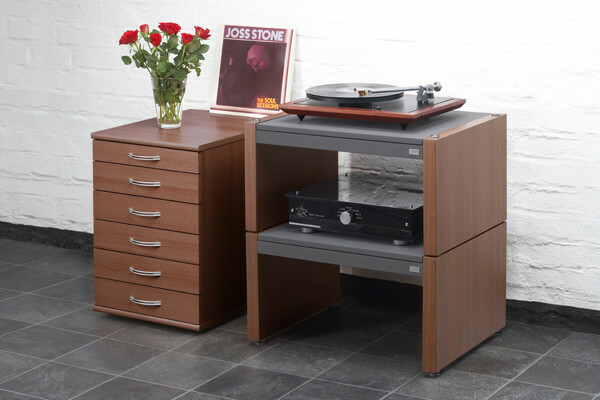 However we have opted for a complex solution which guarantees the best sound. 4 Spikes with 4 support discs so that the module can be set up securely and horizontally aligned. 4 Decorative caps which are screwed into the threads at the top when the modules are set up individually. 4 Stainless steel and Delrin feet which can be screwed into the lower threads instead of the spikes when the modules are stacked one on top of the other. The modules can be set up alongside one another by screwing the spikes into the bottom threads and the caps into the top ones. If the modules are to be stacked, the spikes are only used for the module at the bottom. Then the feet are screwed into the bottoms of the other modules instead of spikes. They can then be inserted into the upward facing thread openings of the rack at the bottom. There they rest on a damper, which prevents vibrations being transmitted to the module on top. 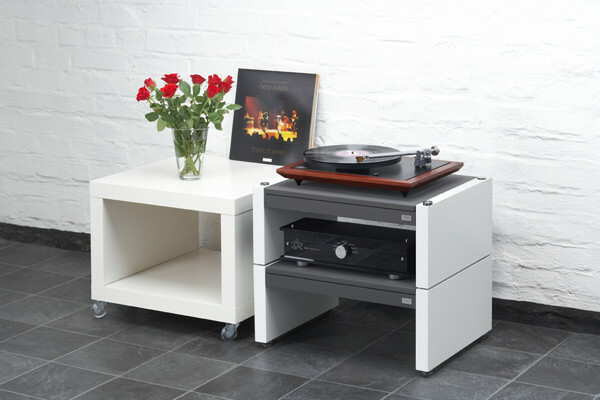 Rest assured that behind this simple-looking and elegant hi-fi rack there is a whole lot of knowledge, experience and testing. All this technology can only be matched perfectly to the interior design of your home, though, if there is an open choice of surfaces. That is what has been achieved here and that is what makes the SMD racks so flexible without any adverse effect on the sound. 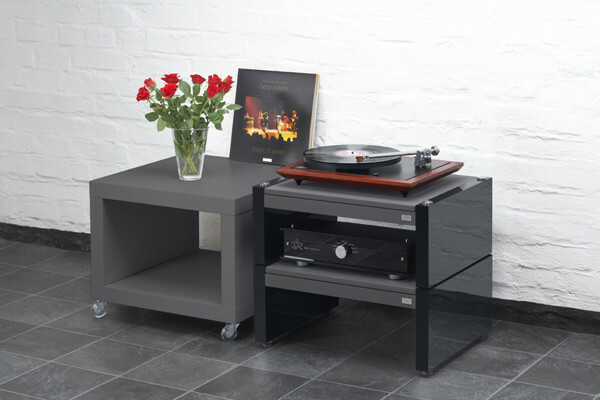 Audiophile THIXAR hifi racks – The Fundamentals of Sound. Other dimensions as well as low-boards are available on request!